Did Romney flip on deporting illegal immigrants? By Eric Stirgus on Tuesday, February 7th, 2012 at 6:00 a.m. In just a few weeks, Georgians will have an opportunity to choose which Republican they want to see battle President Barack Obama for the White House. The Georgia Democratic Party isn’t waiting for the March 6 state primary to weigh in on one of the Republican candidates, former Massachusetts Gov. Mitt Romney. Titled "Mitt Romney: Distortions," a Jan. 27 statement from the state party claimed candidate Romney wasn’t truthful on 10 subjects during a recent debate. The subject that caught our attention was immigration because it’s been such a hot topic in Georgia in recent years. "Romney claimed that he opposed ‘rounding people up and deporting them,’ " that section began. "But just last month, he stated emphatically that people who come to the United States without documentation should ‘go back home and get in line with everyone else’ -- and he has previously made clear that includes even grandparents who have been here for decades and served in their community or in the military." The former governor has faced criticism that he’s constantly shifting his stance on issues to appeal to conservative Republican voters. We wondered whether the Georgia Democratic Party was accusing Romney of changing his position on deporting illegal immigrants. "It’s part of an ongoing pattern of him flip-flopping," Eric Gray said. So do Gray and the party have a point about Romney on immigration? The Democrats base their claim on a recent interview Romney did with the Spanish-language television network Telemundo before the Florida primary, saying it’s inconsistent with statements he’s made in other interviews and on the campaign stump. "[Romney] panders to Telemundo, and when he’s in front of Fox News, he says get in line with everyone else," Gray said. By some federal estimates, there are as many as 11 million illegal immigrants in the United States. The federal Census Bureau estimates the U.S. population at about 312 million people. The Republican candidates have accused Obama of not being aggressive on patrolling the U.S-Mexican border. Obama has countered that he has put more agents there than any president in U.S. history. Romney has proposed efforts that would make it increasingly difficult for illegal immigrants to find work in the U.S. and encourage them to return to their homeland. During one December speech in Iowa, Romney used the language the Democrats quoted in their critique, but he did not mention deportation. "For those who came here illegally, they might have a transition time to set their affairs in order and then go back home and get in line with everyone else," he said. A Romney spokeswoman forwarded us two statements by the candidate, one made in 2007 and the other made last month, that propose similar ideas on immigration. In 2007, Romney referred to what he described as a "realistic attrition program." "If they, for instance, have a child in school, we may let them complete the school year, and then they return home. When they are home, they’re able to apply for permanent residency or for citizenship or anything else they’d like to apply for," he said. During a debate last month in Jacksonville, Romney twice talked about self-deportation. "I don't think anyone is interested in going around and rounding up people around the country and deporting 11 million Americans -- or, excuse me 11 million illegal immigrants into America," he said. To strengthen his argument, Gray directed us to Romney’s comments during a January debate in South Carolina. In that debate, Romney said he did not support the DREAM Act, a proposal by two U.S. senators to give qualifying young people here illegally a six-year path to citizenship that must include the completion of a college degree or two years of military service. Romney then went on to talk about the broader topic of illegal immigration: "I think we have to follow the law and insist those who come here illegally ultimately return home, apply and get in line with everyone else." Now, does Romney mean when he said "insist" illegal immigrants return home that he would round them up and deport them? "That’s deportation," Gray said. "What he does instead of saying deport them, he uses weasel words to say one thing to Telemundo and another thing to Fox News." Mark Krikorian, executive director of the Washington-based Center for Immigration Studies, which believes fewer immigrants should be allowed in the United States, called it "implausible" to say Romney has flip-flopped. Krikorian calls Romney’s position "attrition through enforcement." "Romney has been pretty clear in describing a self-deportation policy," he told us. "He’s been consistent on that." Krikorian noted that Romney threatened to veto a bill to give in-state tuition to Massachusetts colleges to students who are illegal immigrants. A spokesman for the Federation for American Immigration Reform, an organization that wants the federal government to stop illegal immigration and seeks stronger border patrols, said he hasn’t heard Romney talk about deportation. "Nobody who has seriously looked at the issue has said the answer is round everybody up and deport them," said the spokesman, Ira Mehlman. Mehlman said it is implausible to conduct mass deportations. He characterized Romney’s position on illegal immigration as being in the mainstream of thought on the issue. 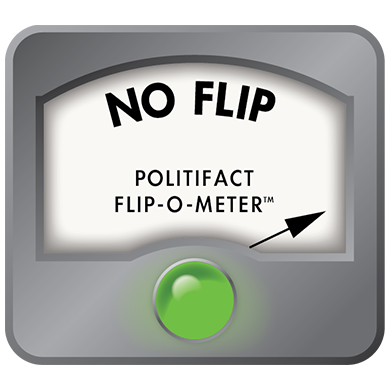 PolitiFact Georgia found articles dating to 2006 in which Romney was quoted as saying he didn’t believe "in rounding up 11 million people and forcing them at gunpoint from our country." In 2007, Romney told The Boston Globe it was not "practical" to deport every illegal immigrant. He has consistently talked about an immigration approach of supporting policies that encourage illegal immigrants to return to their homeland. We don’t see any recent change in his position and rate this one as a No Flip. Published: Tuesday, February 7th, 2012 at 6:00 a.m.